Ten Years ago, when Nicholas Carr wrote a prophetic article for Atlantic Monthly “Is Google Making us Stupid?” my students were all on it. They often express concern about their media use, which I find frankly heartening: They are using their critical faculties to critique their own practices. : One way or another they are all creating websites and are online many hours a day. I’ll paste in the links to Carr’s article below, in case it’s true: we’ve become so stupid we have to have the links provided or it’s just too much work. I know I feel this way today, and it’s only 10 a.m. I’ve already been clicking away on my laptop for three hours. 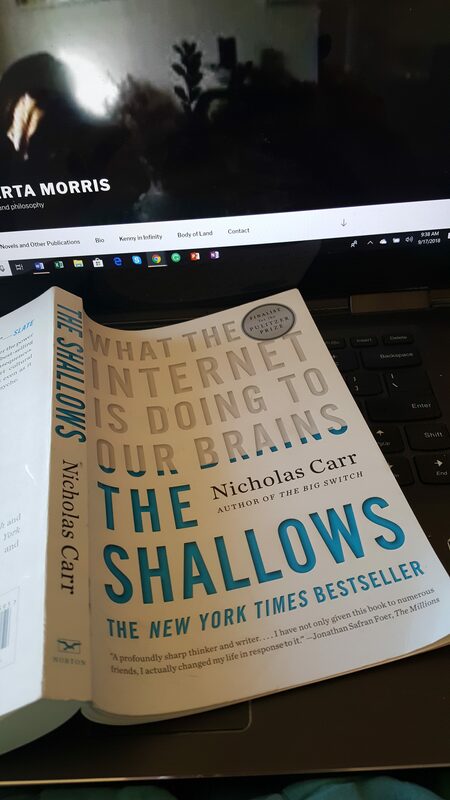 Then Carr took on the neuroscience of it all with The Shallows; What the Internet is Doing to Our Brains (Norton, 2010). Way before the Russian Investigation. OMG Obama was still president. A hundred years ago. So here it is: his book lying on the keyboard of my computer. I’m going back to print media more and more, as are some of my students, even as they’re creating video games for the rest of us. That’s what struck me as entirely reasonable, thinking about why Parker and Stone use 3D animation techniques to create a 2D animation look. New media doesn’t supplant old media. The old becomes more artfully practiced and preserved, bookmaking a treasured skill, as are illuminated manuscripts. Nostalgia? I think not. Carr writes: “For some people, the very idea of reading a book has come to seem old-fashioned, maybe even a little silly – like sewing your own shirts or butchering your own meat.” (p.8) Silly? Tell the good people who’ve organized the alternative-currency TimeBank online, they regularly hosts events that teach you how to sharpen your own knives, not just design and sell your handmade clothes. You’ve got Etsy.com for that. Mend your clothes. A little silly? Don’t dismiss these young eco-friendly craftspeople; they are deadly serious and just might help save the planet stitch by stitch.